From traumatic neuroses to shell shock, war neuroses, war stress, battle fatigue and post-traumatic stress disorder, notions of trauma have dominated the twentieth-century understanding of the psychological impact of war. Shell shock, or what we would now call Post Traumatic Stress Disorder, was being diagnosed in the First World War at alarming rates. In the later half of 1916 there were over 16,000 cases of shell shock during the battle of the Somme in France. Shell shock was the term officially used in 1915 to describe the effect of a bomb or shell exploding close to a soldier. British doctors on the Western front had already realised there were soldiers experiencing two types of shell shock: those with symptoms of physical and mental impairments as a result of exploding shells and soldiers displaying similar symptoms without an exploding shell as the cause. The two types were classified as Shell Shock W (wounded) and Shell Shock S (sick). 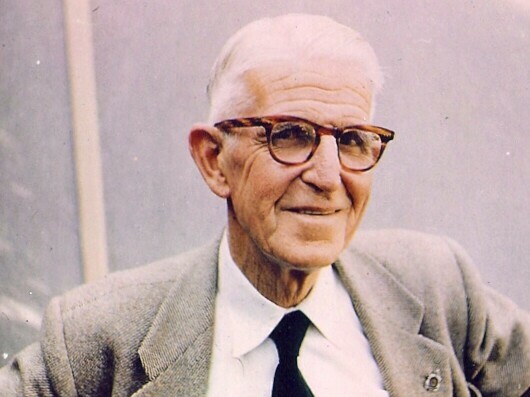 Thomas Farrell was born on 24 February 1888 at Heidelberg, Victoria, the eldest son of Michael Edward (Mick) Farrell and Mary (Molly) Ralston. In the 1870s, before Mick had married, he had been a constable in the Victoria Police in northern Victoria. He had encounters with Ned Kelly before the Kelly Gang went on to kill three policemen in October 1878 and were declared outlaws. When Tom was four years old the family moved to Fish Creek in Gippsland to take up a government grant of farming land. Here they build the family home, ‘Yuulong’. Later generations of the Farrell’s are still there. There were ultimately 10 children in the family with my father, Charles, being the youngest of them. He left this job soon after however – possibly being ‘locked out’ because of a serious wage dispute – and went to Hillston, in the upper Riverina district of NSW, where his Uncle Harry was the licensee of the Royal [Mail] Hotel. 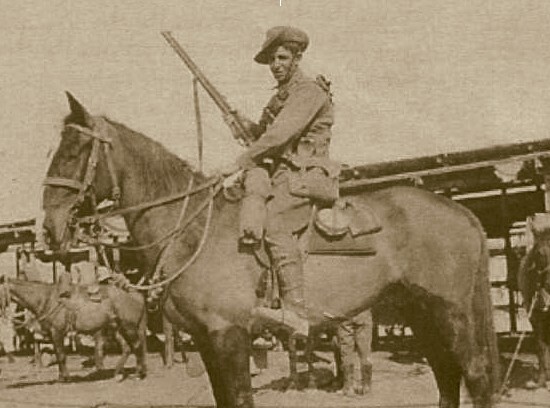 Tom was an excellent horseman and secured a job as a station-hand at Hillston. On the 5 August 1914 Britain declared war on Germany and, as a consequence, Australia was also at war. At the outbreak of the war there were already 23 light horse regiments in Australia made up of 9,000 part-time personnel. Many of these would join the Australian Imperial Force (AIF) to be sent overseas but many more volunteers would be needed. Initially Australia had offered Britain a force of 20,000 troops. But it was going to be a bigger conflict and would be more deadly than most anticipated. By the end of the war, from a population of less than five million, 416,809 men enlisted of which over 60,000 were killed and 156,000 wounded, gassed, or taken prisoner. This was an opportunity that Tom Farrell thought he should not miss. He and thousands of other young men rushed to enlist in the Australian Imperial Force (AIF) and on the 18th of September he joined the 6th Australian Light Horse Regiment in Sydney. The 6th Regiment at full strength was made up of 25 officers and 497 other ranks serving in three squadrons, each of six troops. Each troop was divided into eight sections, each of four men. One of these four would be the horse handler to move the horses to safety while the other three dismounted and fought the enemy as infantry soldiers. The early part of our work was done on foot, and we soon learned to form up in straight lines of troop, number off, form sections, and march properly. Then we went through squadron drill on foot, until every man was capable or responding immediately to the command. Practically the whole of our men come from the country, their occupations varying from young squatters to rouseabouts. These men are, of course, to a man used to the saddle, so that when horses were issued to us, with saddles and bridles, we were in a position to start mounted drill right away. The colony is specially adapted for the breeding of saddle and light harness horses and it is doubtful where these particular breeds of Australian horses are anywhere surpassed. The bush horse is hardy and swift and capable of making very long and rapid journeys when fed only on the ordinary herbage of the country: and in times of drought, when grass and water have become scanty, these animals often perform astonishing feats of endurance. More than 130,000 Walers were sent overseas to be used in World War I. Only one came back to Australia. The training ended late in December and a few days leave was granted before the 6th was due to sail to war from Sydney on 20 December 1914. The voyage ended eight weeks later in Alexandria in Egypt. The regiment moved into Maadi, the Australian Light Horse camp just outside Cairo. Training continued without anyone knowing what they were actually being trained for. Finally, they learned they would be going to help the infantry who had landed in Gallipoli on 25 April. When their commander, General Ryrie, made the announcement a few days before they were due to leave, there were cheers from all present. We sailed from Alexandria on the afternoon of the 15th of May, and on the morning of the 18th, passing by Cape Helles, beheld the truly thrilling spectacle, as it was then, of a naval bombardment and an aeroplane surrounded by puffs of smoke. Finally, on the evening of the 19th, after a run along the edge of the war zone, we anchored off Anzac Cove, and spent a large part of the night listening to incessant rifle fire. They landed on Anzac Cove the next morning. Because of the terrain at Gallipoli the mounted men and officers were deployed without their horses to reinforce the infantry. The 6th Light Horse was assigned to a sector on the far right of the ANZAC line. Their initial work was in the supporting activities of road building, water carrying and ration loading while they waited for their turn in the trenches. Last night about five o’clock, the cook had just brought round our tea and we had just started to eat it, when all of a sudden the Turks started to shell and fire our trenches. It was so sudden that it gave us a bit of a fright. We left our tea and grabbed our rifles, and there we stood with fixed bayonets, waiting for them to charge us. It lasted about an hour. The waiting is the worst part of it. It is the time to test a man when a charge is going to take place. Tom was with C Squadron until 4 October 1915 when he was assigned to Regimental Headquarters. The casualties for the 6th during their time on Gallipoli were high with 23 killed in action, 21 dying of wounds or illness, and 156 wounded. He survived the dreadful carnage, but, like many others, became ill—in his case with jaundice—and after seven months of hell was transferred to a hospital ship on December 1st, and three days later was admitted to a hospital called Mena House at Heliopolis, north-east of Cairo. After nine days of treatment he rejoined his regiment, which was now part of the Egyptian Expeditionary Force, the force that was to push the German-led Turkish forces out of the Sinai and Palestine. It fought at the battle of Romani on 4 August, at Katia the following day, and participated in the pursuit that followed the Turks’ retreat back across the desert. The regiment spent late 1916 and early 1917 engaged on patrol work until the British advance into Palestine stalled before the Turkish bastion of Gaza. This was no picnic. Both horses and men faced incredible hardships from the lack of water and the long marches across the desert. Almost every man in the Light Horse had endured hardships that are scarcely imaginable to us today. They had lived for weeks, sometimes months at a time with only one litre of water a day. They had survived for long periods on tough army biscuits and tinned bully beef that melted to a greasy mess in the heat of the desert. They’d gone for weeks without being able to wash, their bodies crawling with lice. Many nights, they slept on a blanket soaked with horse sweat. They often risked death, sometimes had to kill men in ugly hand-to-hand combat, and saw lifelong friends die horribly. My tongue used to swell occasionally and I was unable to speak for over fifteen minutes sometimes. It always attacked me in spasms. Eventually I had to use the MO [medical officer] who remarked that I was suffering from Neurasthenia [shell shock]. I was finally evacuated to an English hospital at Port Said where I remained for over three weeks. Whilst there I had a further relapse regarding the swelling of my tongue. I was unable to speak for some time and was finally carried into bed. Charles Myers, consulting psychologist to the British Expeditionary Force used the term “shell shock” in the February 1915 issue of The Lancet to more accurately define it as a war-related condition rather than overwork. The range of symptoms presented by soldiers included “hysteria, shaking, stuttering, tics, tremors, as well as loss of speech, sight, and hearing”. Such as condition was not unusual. In fact you could describe shell shock as being an epidemic in WWI. In 1915 alone the Australian Infantry Force had diagnosed 576 cases of neurasthenia during the Gallipoli campaign. No figures are available for the Australian Light Horse in the Sinai, Palestine and Syrian Campaigns. Shell shock. How many a brief bombardment had its long-delayed aftereffect in the minds of these survivors, many of whom had looked at their companions and laughed while inferno did its best to destroy them. Not then was their evil hour, but now; now, in the sweating suffocation of nightmare, in paralysis, in the stammering of dislocated speech. It was October 1916 before Tom was discharged from hospital and put on light duties at the Kantara Camp in Egypt before being assigned in February 1917 to the nearby 2nd Light Horse Training Regiment at Moascar. During the time Tom had been away from his regiment, the Egyptian Expeditionary Force (EEF) had suffered two defeats when attacking Gaza in March and April 1917. 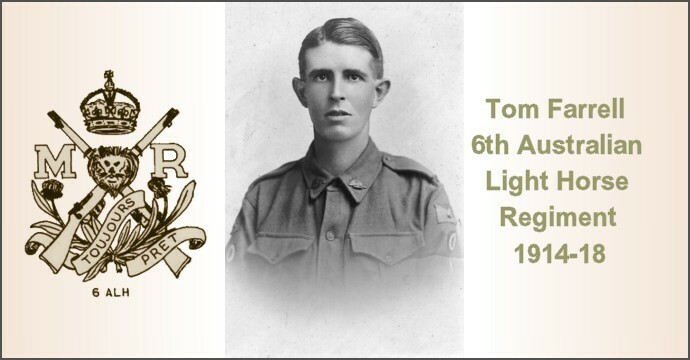 On 25 May 1917, Tom rejoined the 6th Light Horse Regiment at El Sha’uth in Palestine. This was during a six-month period of stalemate between the British and Turkish forces. Mounted patrols took place to keep track of the enemy’s movements in preparation for a battle sure to eventuate. The German-led Turkish forces held a well-fortified line stretching from Gaza to Beersheba. After the second Gaza defeat, General Murray, the commander of the EEF was not about to attack Gaza for the third time without a substantial increase in troops. Murray’s subordinate, General Chetwode, recognised the town of Beersheba could be attacked. When General Sir Edmund Allenby replaced Murray at the end of June the decision was made to attack Beersheba using a cavalry charge. For five days the Regiment remained at Asluj cleaning out wells which had been blown in by the enemy. This work proceeded in shifts day and night and was undoubtedly one of the most arduous undertakings the Regiment ever accomplished. The role of the 6th in the Battle of Beersheba was to protect the flank and capture retreating Turkish soldiers. 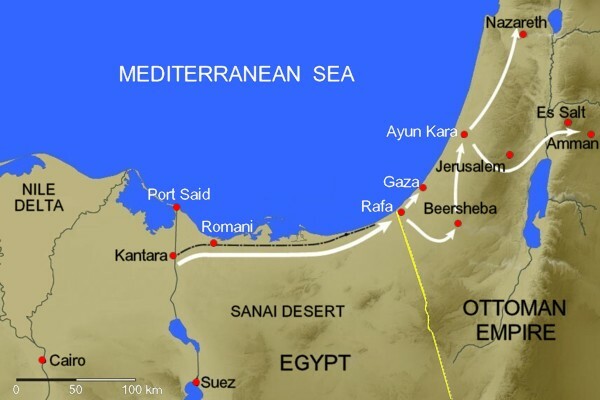 The British went to great lengths to convince the Turks the attack would be on the Gaza end and not Beersheba. The ploy worked. The charge of the 4th Australian Light Horse at Beersheba took place late in the afternoon of 31 October 1917. It was a resounding success and is recognised as the turning point in the Palestine campaign. With the fall of Gaza on 7 November, the Turkish position collapsed. On the 29th of November 1917, he was wounded in action, receiving a bullet through the right wrist. He recovered in the 14th Army General Hospital at Abbassia, not far from Port Said at the northern end of the Suez Canal, rejoining his unit on the 23rd February 1918. In early 1918 the 6th was involved in the Amman (24-27 February) and Es Salt (30 April-4 May) raids, both of which were tactical failures but helped to convince the Turks that the next offensive would be launched across the Jordan. Instead, the offensive was launched along the coast in September 1918, with the 6th taking part in a subsidiary effort east of the Jordan. It was part of the force that captured Amman on 25 September, which proved to be its last major engagement of the war; Turkey surrendered on 30 October 1918. Tom remained with the unit until the Armistice was declared on 11 November 1918. Most of the soldiers could now return home but their horses couldn’t because of quarantine restrictions. Parting with their trusty Walers was one of the hardest events the light horsemen had to endure at the end of the hostilities. Tom sailed for home from Suez on 15 November on the MT Port Darwin, arriving to a welcome in Melbourne on 24 December. He was discharged from the AIF on 22 February 1919, telling the medical officer he was fit. He wasn’t. While he come home physically in one piece, he was affected by his wartime experiences. Back at the family farm at Yuulong in Fish Creek, Tom was depressed and demotivated and could sometimes be found on his own behind the barn whittling a piece of wood. After some time at Fish Creek Tom returned to Hillston in New South Wales and worked at the Royal Mail Hotel. It was here that he met a visitor to Hillston, one Vera Schiller. They were married in 1922 and settled on a farm in Fish Creek where their children Michael, Patricia and John were born. It was hard work establishing the farm and making it a viable proposition. It wasn’t helped by Tom’s depression. He said he was ‘nervy’ since returning home and after two years complained of frequent headaches, sleeplessness and periods of despondency lasting two to four weeks. Tom was admitted to the Military Hospital at Bundoora, in Melbourne, to have treatment for his shell shock, i.e. post-traumatic stress disorder. The electro-convulsive therapy he received seemed to improve his condition, though he was away from the farm for some considerable time. But it was the 1929 crash of the New York stock market and the world-wide depression that followed which finally brought an end to the farm. There simply wasn’t enough money coming in to pay off the loan to the Soldier’s Settlement Commission. About a year or so ago, he found he couldn’t work hard enough to make his farm keep him out of debt and he got still more despondent. From my exam, and observation of him I think he is quite honest and truthful and is genuinely incapacitated from strenuous work. I consider he is a case of war caused anxiety neurosis of a chronic type, and assess his disability at 25% of total, for 12 months, and recommend treatment. So that’s how it transpired that Tom and Vera came to take over the Fish Creek Post Office. All went well until Vera became seriously ill with typhoid fever and died on 4 April 1933. Tom was now the sole parent to three children under 10 years of age. On 2/4/33 his wife died after 3 weeks illness from typhoid fever, since then nervous condition has been worse and now gets spasms when head and neck twist and face screws up and eyes close. This recurs frequently and lasts about ½ min. mentally quite clear at present. Recommend admission to RGHC [Repatriation General Hospital (Caulfield)] for treatment of Anxiety Neurosis. Tom was an avid radio listener, particularly of the ABC news, and he also liked music. He had an excellent ear and after hearing a tune could go straight to the piano and play it note-for-note, quite amazing. . . Playing cards was also a popular recreational activity in the community. The last time I saw Tom was at our wedding in Adelaide on 8 January 1968. He was on his way back to Melbourne after visiting his son John in Perth. He died on 9 January 1970 at Morwell, at age 81. Tom was a friendly, quietly spoken person—his voice was almost a whisper—and one would not normally know the trauma he had been through over the years. He was a true gentleman and a patriot who, like many others, suffered during and after his war service. Robert Hemmings, Modern Nostalgia: Siegfried Sassoon, Trauma and the Second World War (Edinburgh: Edinburgh University Press , 2008), 29. Peter Parker, “The shocks and shells of the Somme,” The Spectator, https://www.spectator.co.uk/2016/04/the-shocks-and-shells-of-the-somme/. Parker, “The shocks and shells”. Peter Leese, Shell Shock: Traumatic Neurosis and the British Soldiers of the First World War (New York: Palgrave Macmillan, 2002), 3. Liza Dale-Hallett, L. (2004) “H.V. McKay Sunshine Collection,” Museums Victoria Collections, https://collections.museumvictoria.com.au/articles/2736. Michael Schiller Farrell, The Memoirs of Michael Schiller Farrell (Norwood, South Australia: Peacock Publications, 2007), 12. “First World War 1914–18,” Australian War Memorial, https://www.awm.gov.au/articles/atwar/first-world-war. Farrell, The Memoirs of Michael Schiller Farrell, 13. “Our Light Horse,” The Forbes Advocate, Dec 4, 1914, 4. T. A. Coghlan, The Wealth and Progress of New South Wales 1887-88, Sydney: George Robertson & Co., 1888, 291. Nicolas Brasch, Horses in Australia: An Illustrated History (Sydney: NewSouth Publishing, 2014), 107. George. L. Berrie, Under Furred Hats: 6th A.L.H. Regt. (Sydney: W. C. Penfold & Co. Ltd., 1919) 21. Berrie, Under Furred Hats, 24. Berrie, Under Furred Hats, 171–3. “Letters from the Front,” Cootamundra Herald, Nov 12, 1915, 3. “6th Australian Light Horse Regiment,” Australian War Memorial, https://www.awm.gov.au/collection/U51043/. 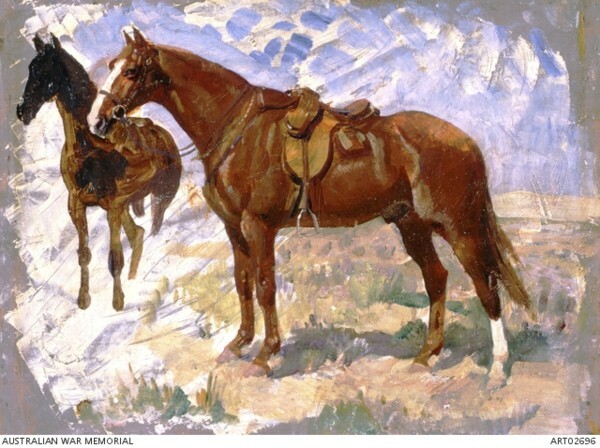 “The Mounted Soldiers of Australia,” The Australian Light Horse Association, http://www.lighthorse.org.au/resources/history-of-the-australian-light-horse/the-mounted-soldiers-of-australia. “Repatriation Case, Farrell, Thomas – Service Number 115,” National Archives of Australia, https://recordsearch.naa.gov.au/SearchNRetrieve/Interface/SearchScreens/NameSearch.aspx. George Beard, “Neurasthenia, or Nervous Exhaustion,” The Boston Medical Surgical Journal, 3, no. 18 (1869): 217–21. Charles S. Myers, “A Contribution to the Study of Shell Shock,” The Lancet, 185, no. 4772 (Feb 13, 1915): 316–20. Craig Tibbitts, “Casualties of War,” Australian War Memorial, https://www.awm.gov.au/wartime/article2. “Chapter II – Moral and Mental Disorders,” Australian War Memorial, https://www.awm.gov.au/collection/C1416802, 88. Robert Hemmings, Modern Nostalgia: Siegfried Sassoon, Trauma and the Second World War (Edinburgh: Edinburgh University Press, 2008), 30. John D. Grainger, The Battle for Palestine 1917 (Rochester, NY: Boydell Press), 80. Farrell, The Memoirs of Michael Schiller Farrell, 14. Marian Bartsch, “The Waler: Australia’s Great War Horse,” directed by Russell Vines, screened April 19, 2015 (Sydney, NSW: ABC TV, 2014), Television Broadcast. “Dr A. A. McKayon Form 83B to Repatriation Department April 7, 1931,” National Archives of Australia, https://recordsearch.naa.gov.au/SearchNRetrieve/Interface/SearchScreens/NameSearch.aspx. “Dr C. G. Godfrey to Repatriation Department April 8, 1931,” National Archives of Australia, https://recordsearch.naa.gov.au/SearchNRetrieve/Interface/SearchScreens/NameSearch.aspx. “Dr A. A. McKay to Repatriation Department April 5, 1933,” National Archives of Australia, https://recordsearch.naa.gov.au/SearchNRetrieve/Interface/SearchScreens/NameSearch.aspx. Farrell, The Memoirs of Michael Schiller Farrell, 49. Posted in Blog, wwi and tagged 6th light horse regiment, australian light horse, egypt, gallipoli, palestine, shell shock, sinai, waler.